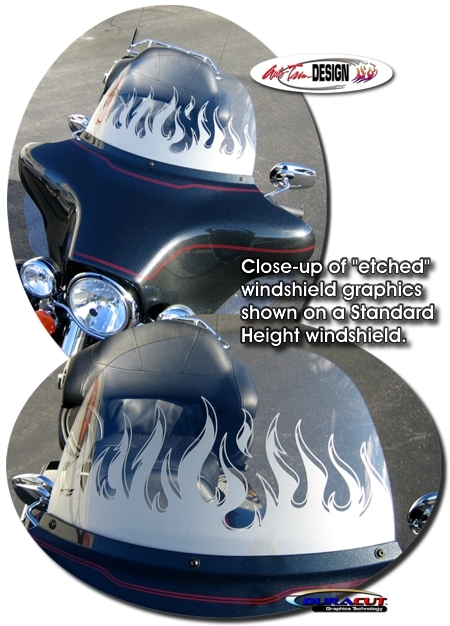 Enhance the look of your bike's windshield with this rich looking "etched" Flame Graphics Windshield kit. The unique vinyl product, when installed on the inside surface of the windshield, gives the flame graphics a frosted or realistic etched appearance. While the graphic kit is fit for the FLHT's standard 12" high windshield, with a little trimming, it can be used on other size windshields as well. Got Windshield Pouches? Be sure to protect your new Flame Graphics as well as the inside surface of the Windshield from chaffing with our easy-to-install InvisiGARD Windshield Pouch Protector kit. It's a "must have" with our Windshield Graphics or not!